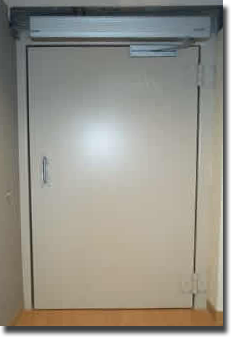 Gaven Industries manufactures custom swinging and sliding Radiation / Neutron Shielded Doors for Medical and Industrial applications. Linear Accelerator swinging doors up to 7,000 lbs can be manufactured and installed for primary and secondary shielding for neutron and gamma radiation. Each door frame is custom designed and built for new or existing facilities. Gaven is also able to design and manufacture large opening sliding doors for metal x-ray labs and industrial uses, employing sliding door operators designed in house. Lead plate can be fabricated and installed in multiple layers of up to 4" thick. Lead brick walls including structural support can also be designed and installed. Gaven Industries manufactures its own line of heavy duty hinges for Linear Accelerator doors with weights up to 13,000 lbs. Our hinges incorporate hardened steel. Below is a fully automatic 5500lb. Linear Accelerator main entrance Door. The frame is set in 38" of concrete.